Comparisons between Petrie’s Peter Ash and Child’s Jack Reacher are inevitable. They are both ex-military with interesting backstories, and they are both laden with enough idiosyncrasies to keep us engrossed for years of happy reading. But Peter Ash is from a different era and suffers from PTSD. 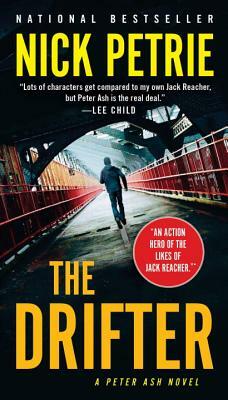 We have more insight into his inner workings than Reacher’s and this is very appealing in Petrie’s series character. Peter Ash has been home from his tours in Iraq and Afghanistan for over a year. He spent most of that time away from civilization, drifting and camping in remote parts of the U.S.. He did this mostly to avoid the white static that overcomes him when he is inside a structure, a result of his tours of duty. He returns from his self-imposed exile to be of service to the family of his best friend, Jimmy, when he learns that Jimmy committed suicide. But when he begins to work on Jimmy’s house, he finds a suitcase filled with cash and things begin to add up to a bigger story and a family in danger. Peter finds himself coming alive again as he uses his detecting skills to uncover what really happened and the violence that follows seems to be salve to his suffering soul. But when a friend from the Marines commits suicide, Ash returns to civilization to help the man’s widow with some home repairs. Under her dilapidated porch, he finds more than he bargained for: the largest, ugliest, meanest dog he’s ever encountered...and a Samsonite suitcase stuffed with cash and explosives. As Ash begins to investigate this unexpected discovery, he finds himself at the center of a plot that is far larger than he could have imagined...and it may lead straight back to the world he thought he’d left for good.